Fifty people gathered in front of the post office on West Michigan Street in a rally to save the Duluth mail processing center. "What do we want?" a man with a megaphone asked the crowd Wednesday. The crowd shouted, "Permanently restored services!" "When do we want it?" "Now!" 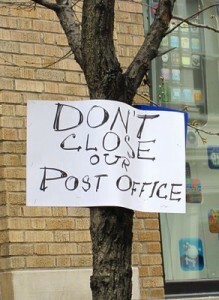 The Northland's city, state and federal officials joined members of the unions affiliated with the United States Postal Service in calling for the mail processing center to be kept open permanently because it serves as a regional hub. The center processes mail for Duluth and Superior as well as the Iron Range, North Shore and other parts of northern Minnesota and Wisconsin. Duluth's mail processing center has been slated to close as part of the Postal Service's consolidation plan to save money. The closure of Duluth's mail processing center will affect both customers and its employees, speakers at the news conference said, noting that the closure means mail service in northern Minnesota will be substandard compared to the Twin Cities. Laurie Olson, board member for the Twin Ports Postal Customer Council, spoke on behalf of Duluth businesses, pointing out that mail delivery time has already increased from two days to four days in some places. "Why is the Twin Cities keeping a standard of one to two days when we have to lower our standards to three to four days?" she asked. Outgoing mail normally processed by Duluth's mail processing center has been sent to the Twin Cities for processing since April 18. The Duluth mail processing center was slated to close April 18, but some mail sorting has remained beyond that deadline. The Postal Service has delayed to 2016 its planned consolidations, including Duluth's mail processing center, in the final phase of its Network Rationalization Initiative, according to Postal Service spokesman Peter Nowacki. "The decision to defer the next phase of the initiative was based upon operational considerations, and was made to ensure that the Postal Service will continue to provide prompt, reliable and predictable service consistent with the published service standards, Nowacki said in a statement. Rep. Rick Nolan said he's introducing legislation that is intended to keep the Duluth mail processing center open permanently. He also sent a letter to the Postmaster General Megan Brennan this week requesting a review of the problems that could be caused by the processing center's closure. Duluth officials are standing with Nolan and the area's other congressional representatives in effort to keep Duluth's mail processing center open, said Daniel Fanning, Duluth's communications and policy director. "This is a big deal for the city of Duluth and it goes beyond Duluth," Fanning said. Closing the mail processing centers is "part of a deliberate plan to diminish the post office service," Nolan said. Overnight mail service is now taking three to six days due to the Postal Service's plan to consolidate its services and save money, Nolan said. In addition, Jeff Larsen, representing the National Postal Mail Handlers Union, said that the closure will cause problems for the employees, some of whom won't be able to relocate for new jobs with the Postal Service because their spouses have jobs here, their kids are in school and they own homes. Nolan mentioned one employee whose work day involves punching in at the Duluth processing center, traveling three hours to Eagan to work for two hours and then traveling back to Duluth to punch out. "Now is that saving money?" Nolan asked. The crowd replied with a loud "no!" Warren Wehmas of the National Association of Letter Carriers pointed out that the truck carrying mail to the Twin Cities to be processed needs to leave the Mount Royal Post Office before the mail carriers return and everything given to the mail carriers then sits overnight. "To get a letter across town shouldn't take four days," Wehmas said. > The article above was written by Lisa Kaczke, and is reprinted from the May 27, 2015 Duluth News-Tribune.